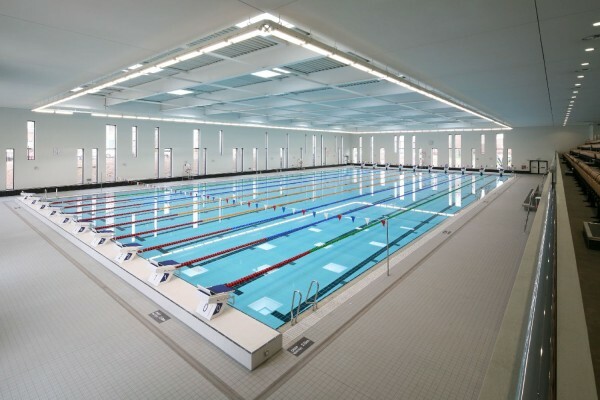 The £18.2M Aberdeen Sports Village Aquatic Centre now features seamless StoSilent Distance acoustic systems in both its Diving Pool and Main Pool, ensuring that noise is kept to a minimum for swimmers and visitors alike. The StoSilent acoustic ceiling solution chosen for the Aquatic Centre is designed especially for demanding environments such as swimming pools. It is based on a StoSilent suspended grid made from steel, which was specially coated to protect against corrosion. This was covered with StoSilent Panel A-Tec Alu acoustic boards. Made from blown glass granulate, these boards are impervious to moisture. They also feature a factory-applied backing laminate which allows the boards to attenuate sound waves, and equally prevents any air from flowing through them and causing marking or staining on the completed ceiling. The boards were then coated with StoSilent Décor M – a sound-permeable silicate acoustic coating which creates a seamless, clean and attractive appearance. The StoSilent Distance system allowed the creation of ceilings in both spaces that provide reliable and effective acoustic damping, but which have a finish that looks visually attractive and helps to distribute light around the pool areas. Although they are light in weight, the StoSilent Distance boards can be worked with ordinary hand tools, which makes them quick and easy to install and provides valuable time savings on a large-scale project such as this, whilst enabling an exceptional standard of fit and finish to be created. They offer a high degree of rigidity and will not rot or discolour, even in the damp pool environment.